Avoid awkward party silence and make your gathering one to remember with these 7 must have party board games! Have you ever attended a party that wasn’t much of a party? Or worse, hosted a party that turned awkward and quiet? Sometimes it can be hard to successfully plan a party when there are so many things to consider; like food, games, decorations, and even cleaning your home before guests arrive. One thing you can easily do to take the stress out of entertainment is having a few party games on hand. Board games are perfect for parties because you do not need to print anything out or gather materials beforehand, simply open the box and the fun can begin! My husband is a huge game board collector. He regularly checks game board review sites and is current on all the up and coming games. 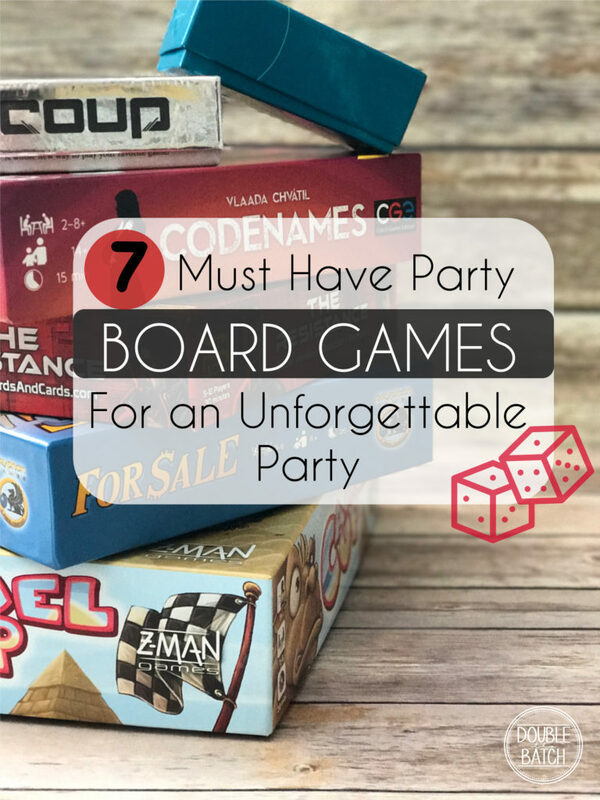 Although there are many great board games that can be played as a couple or a family, party board games are one of our favorites. Party board games are games that can be played by 6 or more people. They are a lot of fun because they are usually quick moving or team oriented. Here are 7 of our favorite, party tested, must have, party board games! Summary: The basis of this game is that each player is an archeologist exploring an ancient ruin. You set up tent and then decide if you will forge into the ruins and look for gold or stay back and end the round. If you enter the ruins you might gain treasures but also risk the chance of encountering hazards such as snakes, fires, and falling rocks. In this game you push your luck and hope you make it out alive! Why It’s Great: For about 4 straight months this was our go to party board game. Even with some of the same people attending the parties, we all enjoyed playing this game over and over again! Although this game has increased in price lately, and once you receive the game you might be shocked by how small and simple it is for the price, it is definitely a lot of fun and a great addition to any home. You can purchase it on Amazon here, or on the popular board game website coolstuffinc here. THE RESISTANCE- Secret Identities, Deduction, Deception. Why It’s Great: This game is great because it brings together all the things you love about Mafia but you don’t risk the chance of being voted to “die” and left sitting out the rest of the game. 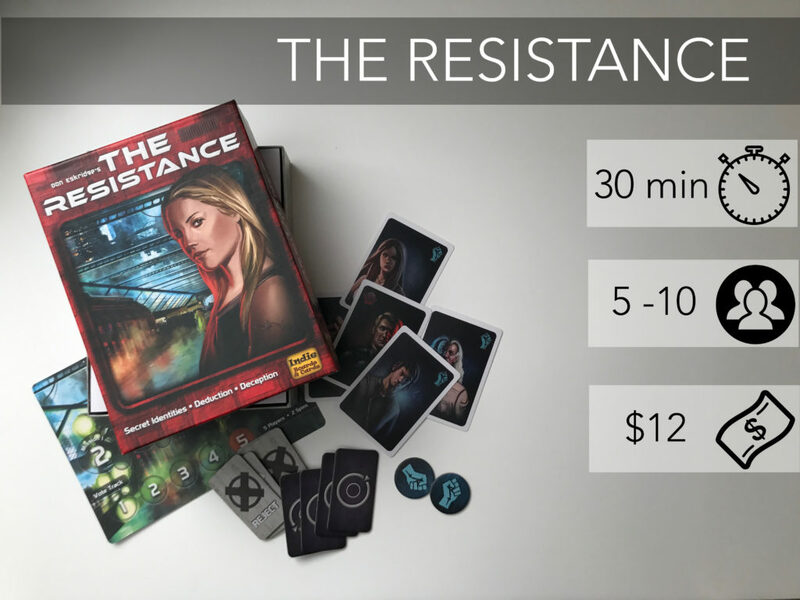 If you love social deduction or bluffing games, this one is definitely for you! It is also very affordable and can include a large group (up to 10). It can be purchased on Amazon here, and often found at target (online here) or walmart (online here). 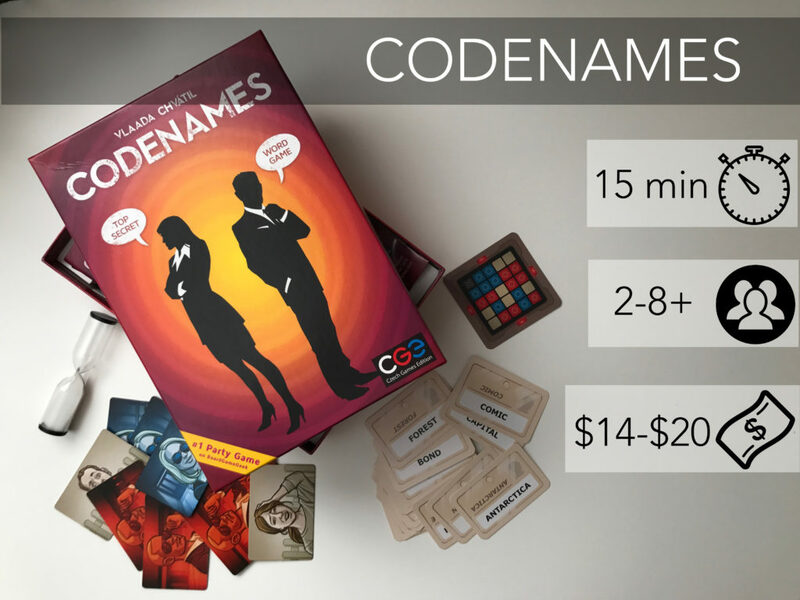 CODENAMES- Top Secret Word Game. Why It’s Great: This is our current go to party board game. It is very easy to set up and explain to new players. Even individuals who do not consider themselves board game people find this game easy and enjoyable. Because there are so many “word cards” you can play over and over again and no round will be the same. We often play multiple rounds in the same evening allowing each player to have a chance being the “spymaster”. This game is very popular right now and can be found in most major retail stores including Target here, Walmart here, and online at Amazon here. Why It’s Great: Although it is the most expensive on the list, it is also the most intricate. One of the main appeals of this game is the fun themed art work and tangible game pieces. For example, when you roll the dice instead of simply grabbing them out of a bag they are released from a pyramid shaped contraption. 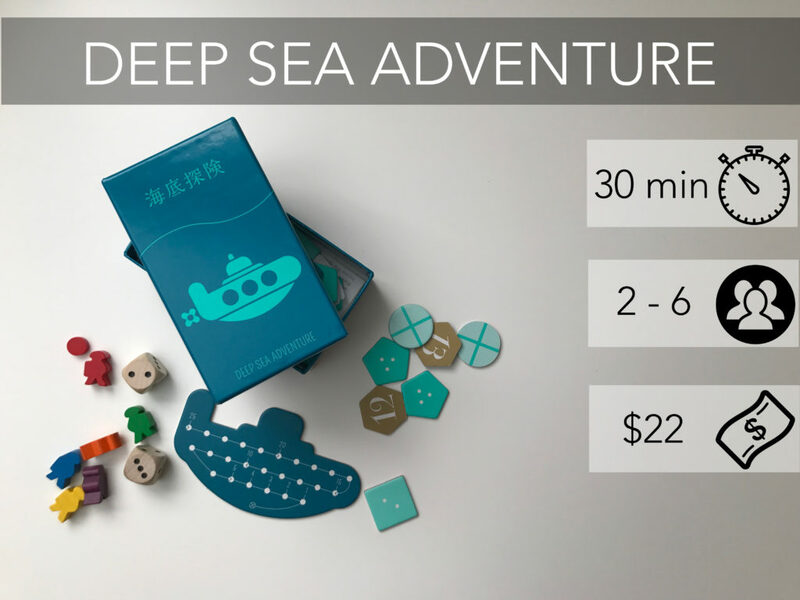 Because of the required set up and intricate pieces, I would suggest this game to parties who are comfortable playing board games and not overwhelmed by complex game play. However, it may be complex but it is not a complicated board game. Those who have played other popular games such as Ticket to Ride or Settlers of Catan will have no problem playing and enjoying this game. 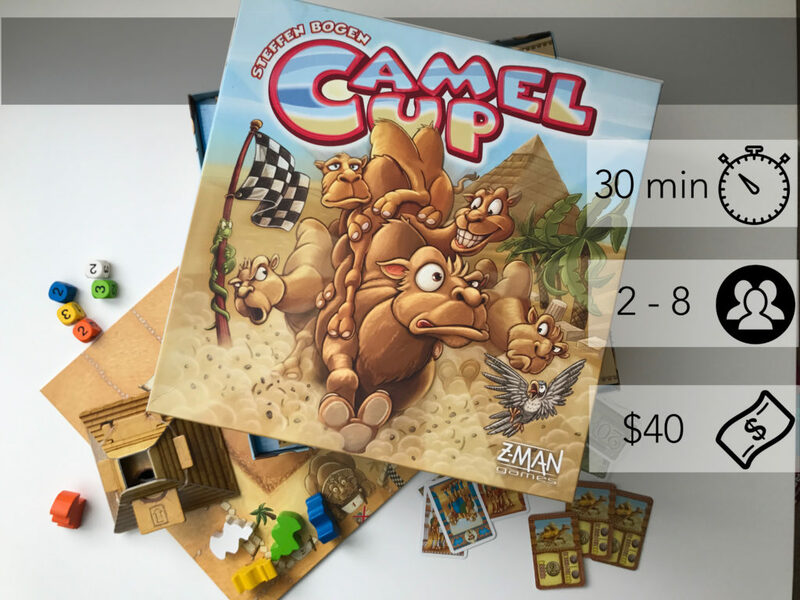 Camel Up can be purchased on Amazon here, or the popular board game website coolstuffinc, here. 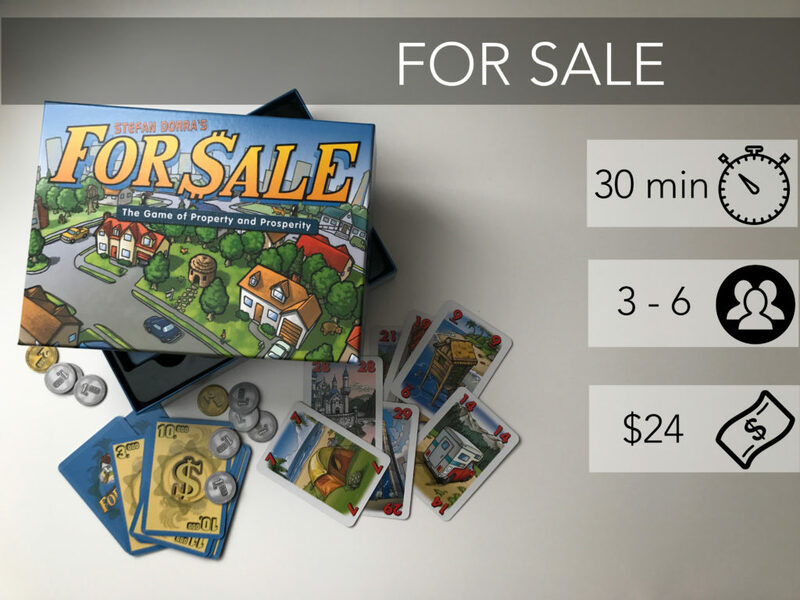 FOR SALE- The Game of Property and Prosperity. Why It’s Great: If your looking for a unique party game for a slightly smaller party, this is the perfect game. The art work is really fun throughout and it’s always fun to see who ends up with the worthless outhouse or cardboard box for a home. It can be purchased on Amazon here, or on the popular board game website coolstuffinc, here. 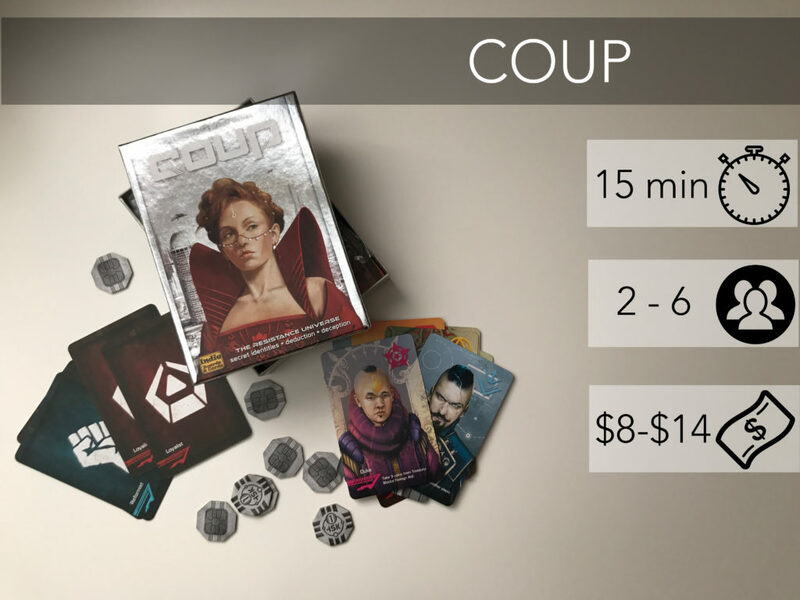 COUP- Secret Identities, Deduction, Deception. Why It’s Great: Created by the same individuals as The Resistance, Coup incorporates the same manipulation and bluffing you enjoyed in the Resistance but this time everyone acts as the deceiver. A really enjoyable game for a slightly smaller party (6 people), that is easy to learn and quick to play. It is also very popular right now making it affordable and easy to find in most retail stores. It can be purchase on Amazon here, and Target here. *There is also an expansion available to add an additional role and expands play to up to 10 players that can be found on Amazon here. 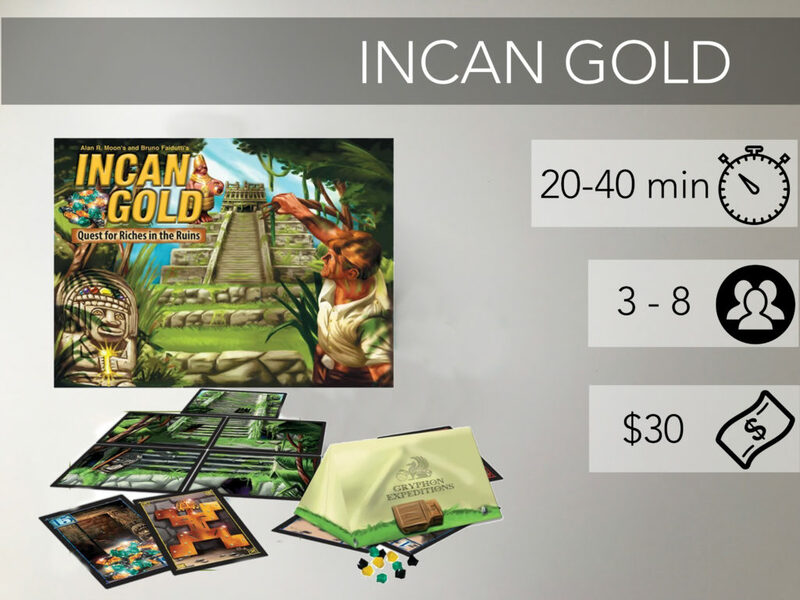 Why It’s Great: Similar to Incan Gold this game is all about pushing your luck, trying to collect the most treasure without staying out too long. This is a great option if you are looking for a unique game for a slightly smaller party (6 people). This game is also very small and compact, the box is no bigger then the size of my hand. Although it is small, it is a lot of fun and a great addition to any home’s party board game collection. It can be purchased on Amazon here. *Although I’ve include online links where you can purchase each of these games, I would suggest checking out your local board game stores. Visiting local stores gives you the chance to look at the game before purchasing and some even have demo libraries where you can play them! 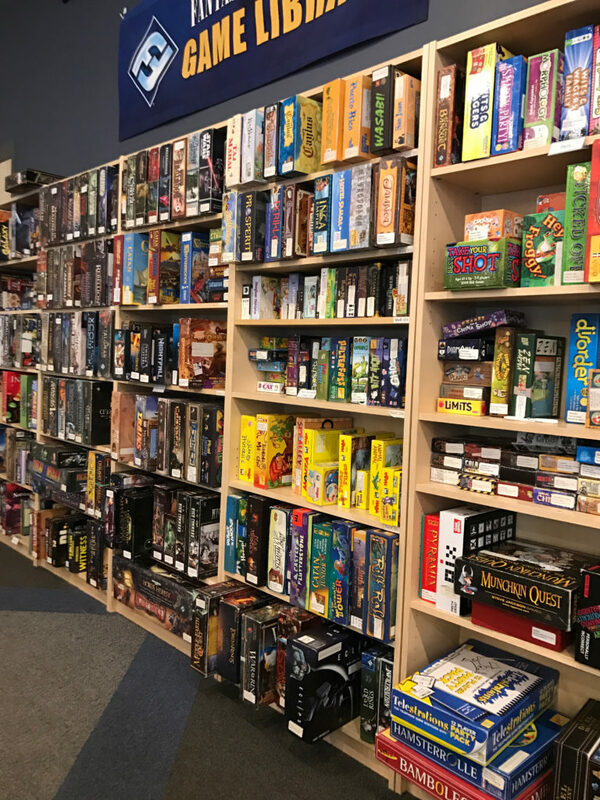 One of our favorite local game stores is very welcoming and has a very large demo game collection pictured below. Which party board games makes your top 7? Are there any you’d add to our list? Comment below!